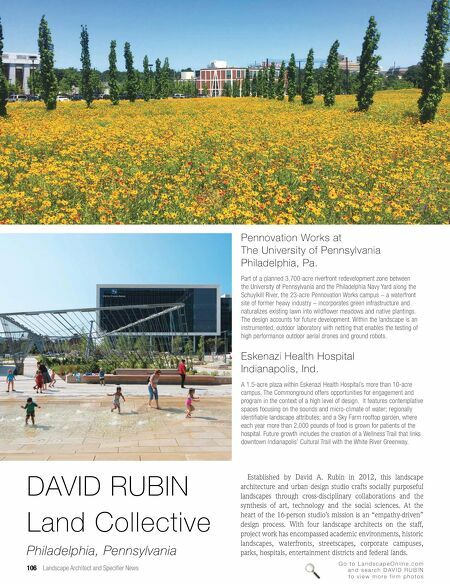 G o t o L a n d s c a p e O n l i n e . c o m a n d s e a r c h D AV I D R U B I N t o v i e w m o r e f i r m p h o t o s 106 Landscape Architect and Specifier News DAVID RUBIN Land Collective Philadelphia, Pennsylvania Pennovation Works at The University of Pennsylvania Philadelphia, Pa. Part of a planned 3,700-acre riverfront redevelopment zone between the University of Pennsylvania and the Philadelphia Navy Yard along the Schuylkill River, the 23-acre Pennovation Works campus – a waterfront site of former heavy industry – incorporates green infrastructure and naturalizes existing lawn into wildflower meadows and native plantings. The design accounts for future development. Within the landscape is an instrumented, outdoor laboratory with netting that enables the testing of high performance outdoor aerial drones and ground robots. Eskenazi Health Hospital Indianapolis, Ind. A 1.5-acre plaza within Eskenazi Health Hospital's more than 10-acre campus, The Commonground offers opportunities for engagement and program in the context of a high level of design. It features contemplative spaces focusing on the sounds and micro-climate of water; regionally identifiable landscape attributes; and a Sky Farm rooftop garden, where each year more than 2,000 pounds of food is grown for patients of the hospital. Future growth includes the creation of a Wellness Trail that links downtown Indianapolis' Cultural Trail with the White River Greenway. Established by David A. Rubin in 2012, this landscape architecture and urban design studio crafts socially purposeful landscapes through cross-disciplinary collaborations and the synthesis of art, technology and the social sciences. At the heart of the 16-person studio's mission is an "empathy-driven" design process. 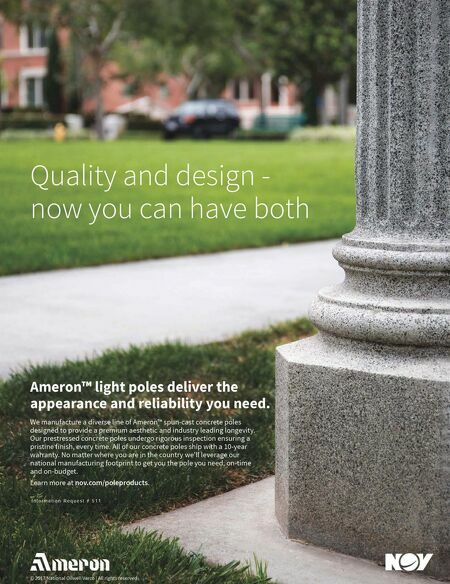 With four landscape architects on the staff, project work has encompassed academic environments, historic landscapes, waterfronts, streetscapes, corporate campuses, parks, hospitals, entertainment districts and federal lands.